There is no denying it anymore: summer is in full swing and, here in Nebraska, it is a hot one! We are in go-go-go mode, between swim team, tennis lessons, camps, and lots of time with family and friends. When I get dressed in the morning, I have two things in mind – staying comfortable and staying cool. I’ve said it before, but I am a capsule wardrobe dropout. I still really like the concept, so I’ve stuck with some parts of the capsule wardrobe philosophy. These busy days are made so much easier when I have a summer uniform – that go-to outfit formula that always looks and feels good. A trip to the zoo, checking out books at the library, chatting with other parents at swim team practice – I can wear this uniform in many variations to just about anything! And I am SO STINKING COMFORTABLE. You can find these pieces so many places, but I have to tell you about a few of my favorites this season! 1. This women’s loose tank by A New Day at Target is super soft, flowy, and comes in many colors and patterns! The best part is the price: originally $8, but on sale for $5 right now! 2. 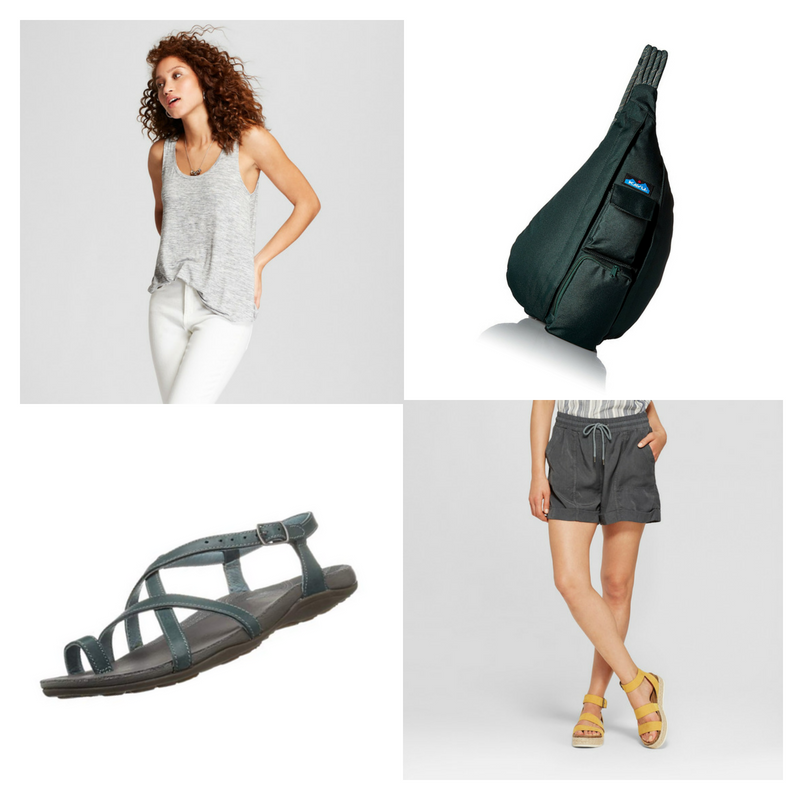 My feet now require more supportive sandals (stupid plantar fasciitis) and these leather Chaco Dorra sandals in teal are my favorite! They look just as great with a dress and can handle just about any activity, including some of the hiking we did in Yellowstone this summer. I currently have two pairs of Chacos and they are worth every penny! 3. I want to hug whoever decided to make pull-on shorts for women a thing this summer. Not only are they easy to wear, but they are SO cute! Target has several different variations of color, length, and style. 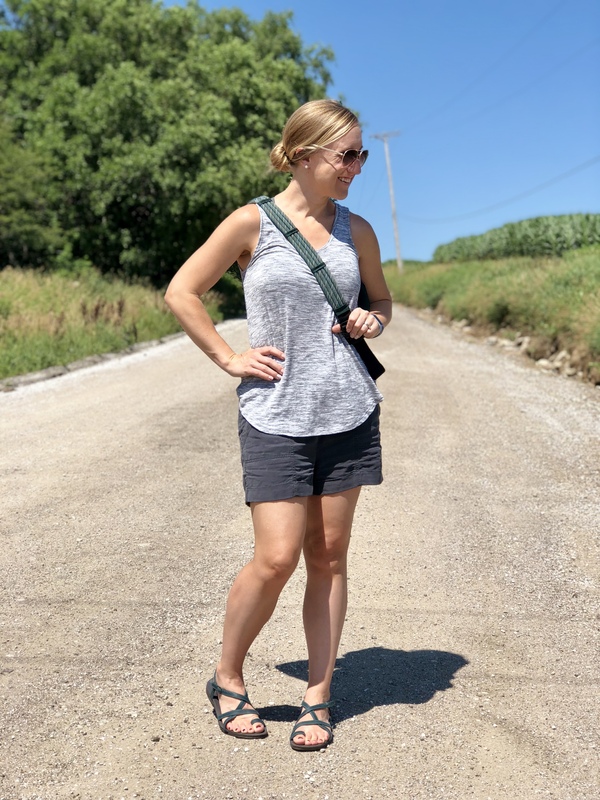 I’m wearing the Universal Thread utility short in gray – the perfect longer option! I also love the Universal Thread pull-on shorts, which are a little shorter. 4. 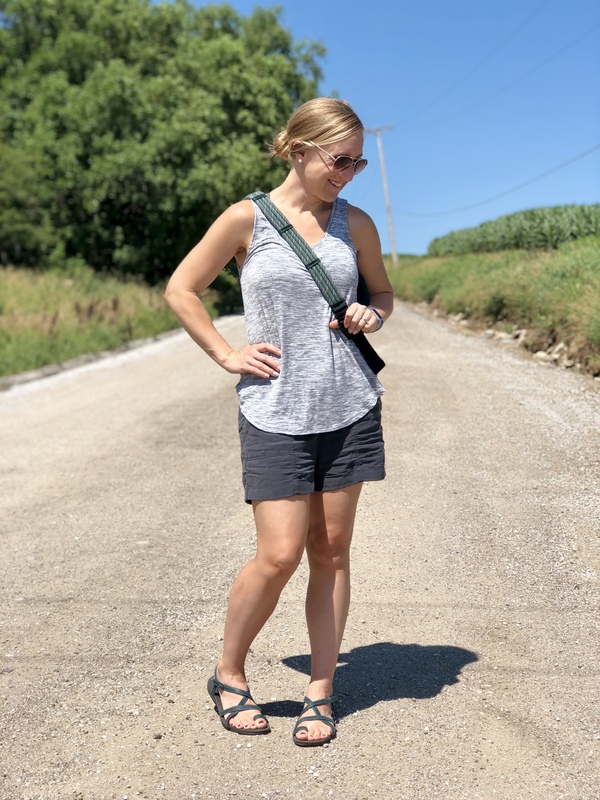 My favorite crossbody bag wore out this year and I was so sad, until a local friend recommended Kavu bags to me as a durable, functional, and stylish alternative. 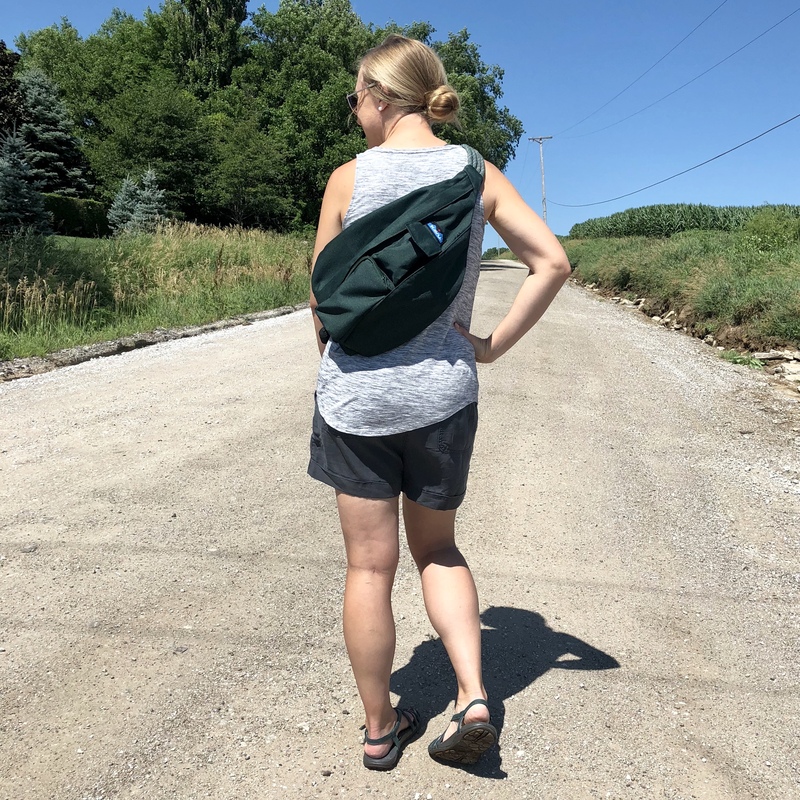 I picked out a crossbody bag first, but the Kavu Rope Sling Bag is the one that has stolen my heart! You can find the Kavu Rope Sling Bag in SO many colors and patterns. Obviously, I had to go with green! It holds way more than I thought it would, the fabric is sturdy, and it feels very comfortable to wear, even packed full! I’ve seen lots of people using it for hiking and wish I had bought it before our Yellowstone trip! I feel like having this four piece formula gives me a quick, easy way to get dressed every day without wasting time or energy. I can always accessorize to mix it up a little, but it’s enough to just wear some earring studs and aviators with this simple look! What does your summer uniform look like? Tanks or tees? Shorts or skirts? Maybe maxi dresses? I’d love to hear what makes you feel most comfortable during these hot summer days!